DROID Incredible Ship Date Moves Up! Been a lot of Droid X talk over the last day or so, but tonight we have good news to those that kept their Droid Incredible orders even after months of delays. 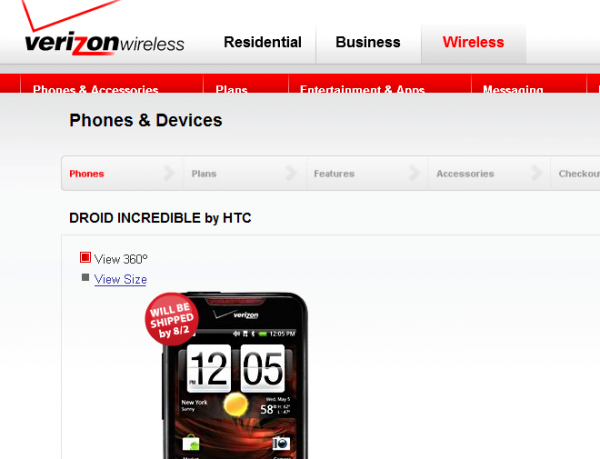 Verizon has updating the latest shipping date, this time moving it up to 8/2 from 8/9. Woohoo! And so you know, 8/2 is really just over 2 weeks away. Not bad at all. Has HTC finally caught up on production after switching to LCD screens? After seeing this simple date change it would appear that they are at least taking steps in the right direction.